You’ve hired some of the best and brightest employees in the industry. They are creative, capable, and great at working independently. Unfortunately, there’s no camaraderie in your office. Your employees are focused on getting their job done, not on helping the team—or the company as a whole—flourish. You know how important teamwork is to the level of happiness and productivity at work. You know that the more your employees work together as a solid unit, the better it will be for everyone. You know that your employees are business rock stars… you just want them to perform more like a band than a room full of solo artists. Fostering a strong team culture can help improve morale and productivity while limiting employee turnover, sick days, and that “case of the Mondays” that’s been following your team 5 days a week for months now. You’ll want to encourage your team members to get to know one another, trust one another, and respect one another. You can do that through team building activities. Get a Team Building Speaker Who Puts on Great Events! You want to create a strong team, but the idea of doing trust falls and singing “Kumbaya” just doesn’t appeal to you. 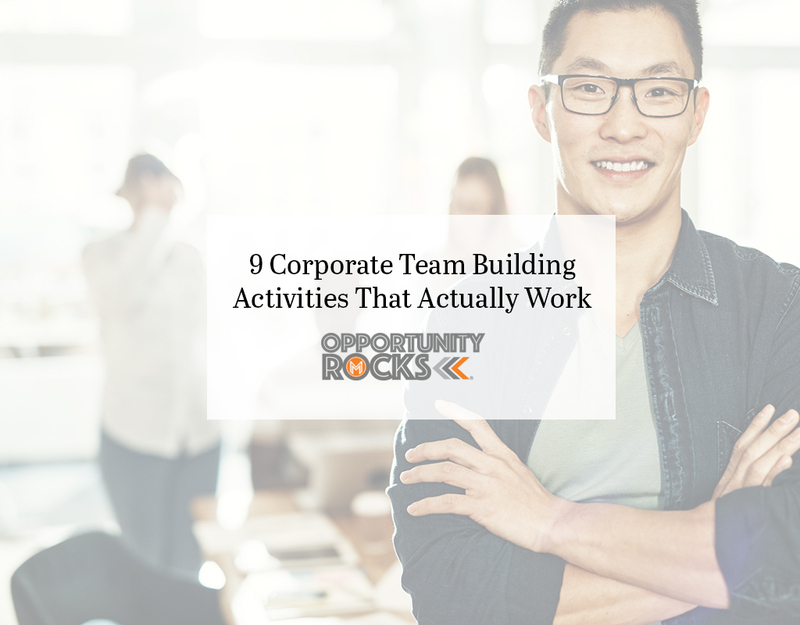 Thankfully, there are a variety of team building activities that will have your employees excited to participate rather than glancing for the nearest Exit sign. Related: Do Team Building Workshops Actually Make a Difference? Chances are that your employees have been working together for months, if not years, yet don’t know much about each other. This exercise will give them the opportunity to get to know one another. Divide your team into sets of two and give each partner 2-5 minutes to interview the other about their childhood, experiences, hobbies, dreams, etc. Once each partner has had a chance to go, give them a few minutes to write up a commercial about their partner. Then, have each team come up and give a 1 minute commercial about each other. A team that plays together, stays together. Break your employees into teams of 3-5 people and then assign them a situation to act out. Your employees will have the opportunity to have fun supporting each other, and they’ll exercise their “quick thinking” muscles. Pay attention to when your employees hit their lowest energy point of the day. Is it in the morning? In the afternoon? Incorporate Half-Time Trivia into your day to get them excited and working together. Divide your staff into teams of 3-5 and ask them a trivia question. The first team to come up with the right answer receives the points. The team with the most points at the end of the week (or month) gets a prize. Work environments can get stuffy and extremely serious. Get your employees feeling comfortable with one another and bonding by giving them the opportunity to act silly and have fun. You don’t have to be a great artist or actor to benefit from these games. Encourage your employees to get on the same “wavelength” with their coworkers by playing a few rounds of Pictionary or Charades each week. Divide your staff into two teams and designate one employee as the “artist” or the “actor” Give them an item to draw or act out while their teammates try to guess what they’re doing. Provide prizes for the winning teams. Encourage creativity and teamwork with a Shark Tank inspired game. Divide your employees into teams of 2-4 people and give them a set period of time to create a new product. You can either give them well-known objects to repurpose or have them start from scratch and pure imagination. Once they’ve created the products, they’ll have to identify the target market, price the items appropriately, and determine a marketing and distribution plan for their new venture. They’ll present their products to staff, and you’ll judge their work based on creativity, presentation, and, most importantly, how well they worked together to create their product. You can even open the judging to votes from the other teams. Winners can receive a prize, or perhaps even a dinner for them to enjoy together. Chances are you’ve got some really interesting people working for you. Outside of work, many employees have interesting hobbies and intriguing stories and have traveled to fascinating destinations. Select a few people each week to bring in an interesting object from their life and tell the story behind it. This not only provides a break during the day, it also allows your employees to get to know each other better and bond on shared interests or experiences. Diversity is now the norm in business. You’ve likely got individuals from different cultural, racial, or religious backgrounds working together in one office. Instead of ignoring their differences in the name of political correctness, celebrate their unique heritages with food. Throw a potluck party where each individual brings a dish from their culture to share with the group. Provide each employee with the opportunity to share information about their dish and perhaps a personal story from their childhood. Keep in mind that there are a lot of food allergies and different diets these days. For safety purposes, make sure that each dish is labeled with all of the ingredients and any cooking methods that may be important. Encourage your employees to find their true inner rock stars. Divide them into “bands” of 4-5 members and allow them to write their own songs that they can then perform for the group. They can use “instruments” they find around the office, or you might just discover that some of your employees have actual musical talent and would be willing to play their real instruments for the group. This exercise gives employees the opportunity to get creative, learn more about one another, and showcase their musical talents while bonding. Your employees probably spend enough time cooped up in a stuffy office. When the weather is nice, set up a scavenger hunt on your company’s property, or if you’ve got a few hours to dedicate to the game, you can extend the perimeter elsewhere in town. Break your staff up into teams of 3-5 employees and then provide clues for them to track down the treasure. Supply prizes for the winners. This will get them thinking more creatively and working together as a team. People love to help. Sometimes, they just don’t know how. Get your employees together to choose a cause that’s close to their hearts (you’ll want to rotate this throughout the year to please as many people as possible), and then give them a day each month or each quarter to volunteer as a team. This can be anything from walking dogs at an animal shelter to packing lunches for the homeless or reading to children at the local school. Give your employees time to get involved in the community, and then provide the space for them to discuss the experience as a team. The possibilities for team building activities are endless. Get creative and give your employees the time and the space to form tight-knit relationships with coworkers. Then sit back and watch morale and productivity soar.